A microorganism or microbe is an organism which is microscopic, making it too small to be seen by the unaided human eye. The study of microorganisms is called microbiology. Microorganisms include bacteria, fungi, archaea, protists and viruses, and are among the earliest known life forms. The first of these four types of microorganisms may either be free-living or parasitic. Viruses can only be parasitic, since they always reproduce inside other living things. Most micro-organisms are single-celled, or unicellular organisms, but there are unicellular protists that are visible to the human eye, and some multicellular species are microscopic. Microorganisms live almost everywhere on earth where there is liquid water, including hot springs on the ocean floor and deep inside rocks within the earth's crust. Such habitats are lived in by extremophiles. Microorganisms are critical to nutrient recycling in ecosystems, because they act as decomposers. Because some microorganisms can also take nitrogen out of the air, they are an important part of the nitrogen cycle. Pathogenic, or harmful, microbes can invade other organisms and cause disease. Free-living microbes get their energy in many different ways. Some use photosynthesis, like plants do. Some break down natural chemicals in their environment. Others feed on things that were once living, such as fallen leaves and dead animals, causing them to breakdown or decay. Some fungi and bacteria cause food to decay. Moldy bread or fruit, sour milk, and rotten meat are examples of decayed food. In nature, decayed materials mix with soil, providing essential nutrients for plants to use. Without this process, the nutrients in the soil would run out. These types of organisms are called decomposers. They are the natural recyclers of living things on our planet. 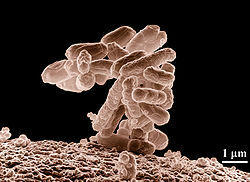 Some microbes, often called germs, cause illness or disease. They are parasites which live by invading living things. Chickenpox, mumps, and measles are all caused by viruses. They are infectious diseases. Certain bacteria cause tooth decay. It is possible to protect humans against some harmful microbes by storing and preparing food properly, cleaning the teeth, washing hands, and by avoiding close contact with ill people. All animals seem to have bacteria and protozoa living in or on them without doing much harm. Sometimes, as with herbivores, the microorganisms are vital to the digestion of food. The human gut has more organisms living inside it than there are cells in the human body. ↑ Rybicki E.P. 1990. The classification of organisms at the edge of life, or problems with virus systematics. S African J Sci 86: 182–6. ↑ Lwoff A. 1957. The concept of virus. J. Gen. Microbiol. 17 (2): 239–53. PMID 13481308. ↑ 4.0 4.1 4.2 Dinorah Pous (2003). Blue Planet. McGrawHill. ↑ Sears C.L. 2005. A dynamic partnership: celebrating our gut flora. Anaerobe 11 (5): 247–51. doi:10.1016/j.anaerobe.2005.05.001. PMID 16701579.